***As a result of Andy Gill suffering from a serious chest infection (which has been causing him breathing problems) he has been advised by his doctor not to fly and so we need to postpone the Australia & New Zealand tour to November. Andy would like to thank all the fans who have sent him messages of support. 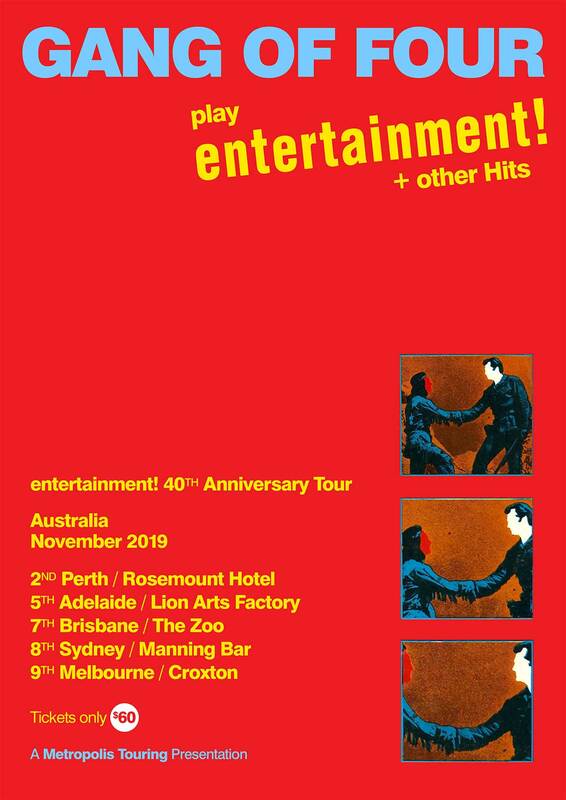 GANG OF FOUR play Entertainment! (Damaged Goods, Anthrax, Naturals Not In It, At Home He’s a Tourist etc) in Full to celebrate its 40th Anniversary! + encore of other Hits (I Love a Man in Uniform, What We All Want, Paralysed, To Hell With Poverty + more)!